Gretchen Rubin’s book The Happiness Project is right up my self-improvement-give-me-a-project-alley and I devoured it when it first came out. In addition to giving me an incentive to clear some clutter, and celebrate more holidays, that piece of advice morphed into what has become my go-to habit for large projects. When I’m starting a writing project, I write something – even just a little something – every day I possibly can. It was the math that convinced me. If I need to get 36,000 words down on paper, and I write 1,000 words a day, that’s a draft in a month and six days. That’s seems so….achievable, doesn’t it? For me, 1,000 words a day is still a stretch. I have a full-time day job, kids, family obligations, and all the other stuff (like laundry, oh, the laundry!) that pulls me in a million directions. A daily commitment to anything above and beyond the basics has never been my strong suit. I have page-a-day diary my parents gave me in the second grade. Its 365 pages contains entries from second, third, fourth, and probably seventh grade. None of the entries overlap and the diary is at least half empty. I will clearly not be leaving behind a vast repository of my intimate thoughts for my children and grandchildren to pursue (thankfully!). But a daily habit for a limited period of time? That, it turns out, is an entirely different beast altogether. That is something I can do. 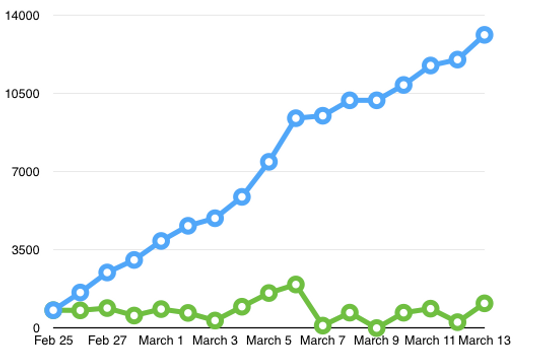 The blue line is the writing project, growing. The green line is the little bit every day. Some of those days are in the 200 range, a few gems are over 1,000. Even those 200 words add to the blue line, though. Here’s what I didn’t expect: The habit is transferrable. Exercise? 20 minutes four times a week makes a difference. An overwhelming project in the office? Map it out and break it down. That graph only shows one part of the project. There’s the idea stage, the brainstorming, the planning and picking a start date. After, there will be review, revision, and redo. The totality of the work can be a big barrier for any significant project. Break it out and focus on one step at a time. If you think “It’ll take a year to do that!” remember, that year will pass no matter what. Where do you want to be at the end of the next twelve months? Whether it’s the friend who carpools with you to the gym, the writing partner, or the co-worker who agrees to review your project, find a friend. Their energy, enthusiasm and support will get you through the middle. There’s something reassuring about seeing the line grow. It doesn’t matter if you track your time, or your output. When you commit to writing something down every day – even the zeros – you have a realistic record of what you’ve accomplished. No fooling yourself. It’s also important to notice things that are impacting your project. Weekends are productive? Mornings? Having some data helps you adjust around your priority. I’m assuming that the project you’re working on is a priority. So, don’t let it become something you dread. Mark down those zeros when you have a day that got away from you because you will have those days. But don’t let one zero deter you from accomplishing your mission. That line will go up because every bit of effort adds to the total. It’s like raindrops in a bucket. Tiny but plentiful, they’ll fill it up. When you get to a milestone, do something wonderful. Even if there are more stages to go, you’ve stuck with your project through a commitment. It may not be perfect, but you’ve got something to work with – something you wouldn’t have if you’d been too overwhelmed to begin in the first place.